Freedom. It's an essential part of an active life. It means setting your own agenda, getting behind the wheel and going where you want to go whether you're running errands across town or visiting family and friends across the country. Mobility Products & Design gives you that freedom. For 52 years, we've been designing and refining customized, ergonomic driving controls that keep you actively involved in your world. MPD controls look as good as they perform, with finished surfaces and sleek lines to complement your vehicle's interior. They are adaptable to most cars, trucks, and vans, and they are flexible enough to allow an ambulatory person to operate the vehicle with ease. This control has everything the "Classic" 3500F offers, but with additional options. For instance, your installer can choose the handle angle to suit your preference. If you are tall, it can be angled around your leg so that you can reach full acceleration. If you have difficulty reaching the turn signal. The handle easily adjusts closer to the turn signal lever. This control has everything the "Classic" 3500K offers, but with additional options. For instance, your installer can choose the handle angle to suit your preference. If you are tall, it can be angled around your leg so that you can reach full acceleration. If you have difficulty reaching the turn signal. The handle easily adjusts closer to the turn signal lever. This control has everything the "Classic" 3500F offers, but with additional options. For instance, your installer can choose the handle angle to suit your preference. If you have difficulty reaching the turn signal. The handle easily adjusts closer to the turn signal lever. This control has everything the "Classic" 3500K offers, but with additional options. For instance, your installer can choose the handle angle to suit your preference. If you have difficulty reaching the turn signal. The handle easily adjusts closer to the turn signal lever. 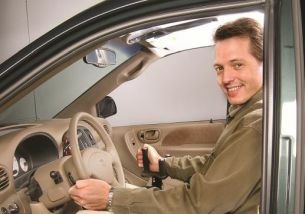 Veigel is the internationally leading manufacturer of driving school systems and driving aids for handicapped persons. They believe in absolute customer satisfaction which we are achieving by developing and manufacturing our products at the highest quality level. With over 80 years of experience manufacturing adaptive driving products like, mechanical hand controls, and an inhouse R&D facility everything Veigel manufacture has been designed and tested to meet the highest standards in quality, function and design. The average employee has 15 years of experience at Veigel Automotive. The combined effort of so many years of dedication and focus have resulted in the highest quality, most reliable and safest products on the market. The Veigel hand control expertly installed by Automotive Innovations for accelerator and brake fits perfectly into the interior of modern vehicles. Thanks to the ergonomically optimized handle and the additional individual adjustability of the grip angle the acceleration becomes easier, fatigue-free and adapts to every hand position of the driver. To accelerate you simply turn the handle on your hand control clockwise. In order to break, just push the hand control slightly front wise. The break can also temporary be locked in place. The hand control can also easily be fold away. To accelerate the ergonomically designed handle is only to pull backwards. A short push forward activates the break, which also can be temporary locked in place. As the CLASSIC, the COMPACT can also be fold away. The Basic installed by Automotive Innovations, MA Commander enables the driver to indicating in each situation, even at a roundabout, without repositioning or letting your hand loose of the steering wheel. Also this switch is really easy to use and fits perfectly to the award-winning design of the Veigel hand control. Needles to say, that the original lever still can be used as normal. •The Basic Commander is available for the COMPACT and the CLASSIC hand control. •Complying with your request you can order the hand control in leather-clad. Veigel North America is an acknowledged engineering partner of the automotive industry, and the internationally leading manufacturer of driving school systems and driving aids for handicapped persons. We believe in absolute customer satisfaction which we are achieving by developing and manufacturing our products at the highest quality level. With over 80 years of experience manufacturing adaptive driving products and an in house R&D facility everything we manufacture has been designed and tested to meet the highest standards in quality, function and design. The average employee has 15 years of experience at Veigel Automotive. The combined effort of so many years of dedication and focus have resulted in the highest quality, most reliable and safest products on the market. Along with the installation by Automotive Innovations, MA the Veigel hand controls are unmatched in design and execution. This unique combination of function and design result in a reliable product that is easy to use and integrates perfectly with your cars interior.